Adam Kiekebosch, Infrastructure Director, ASPECT Studios. Melbourne’s Level Crossing Removal Program has been progressively removing level crossings from across Melbourne since 2015. The benefits of grade separated rail in alleviating traffic congestion, improving safety, and increasing the capacity of the train network are obvious and can be achieved through a variety of approaches. The ancillary benefits these projects can bring to the urban fabric of our cities are less well understood by the wider community, and while not a primary motivator in undertaking these projects, it is in this area that perhaps the greatest transformational opportunities lie. Importantly, when considering their potential to leave a lasting, positive legacy upon the communities that they touch, not all grade separations are created equal. The $1.6 billion Caulfield to Dandenong Level Crossing Removal Project, an elevated rail grade separation project along the Cranbourne to Pakenham rail line in Melbourne’s south east, involved the removal of nine level crossings and a complete rebuild of Carnegie, Murrumbeena, Hughesdale, Clayton and Noble Park stations. The term ‘Sky Rail’ was coined shortly after the announcement of the project by those who opposed it, with communities across Melbourne subsequently rallying en masse in opposition. With several additional elevated rail projects flagged for other sites throughout the city, the highly politicised term is once again taking a prominent place on the political stage. Though the true success of such a project can only be measured in time, with the recent completion of the Caulfield to Dandenong Level Crossing Removal Project it is timely to step back and consider whether these initial fears were well founded, or whether elevated rail has been unfairly demonised. The concept of elevated rail is not new in Melbourne. However, the existing elevated rail lines were constructed prior to significant suburban development in the late 19th century, enabling communities to develop around the rail corridor and stations in an organic, evolving manner, with neighbourhoods shaping themselves to fit the structure. The Caulfield to Dandenong Level Crossing Removal project broke this mould in that it proposed a significant change across an extensive, established tract of suburban Melbourne. Many within the community were naturally wary and fearful of such change. Comparatively, sunken rail lines are generally viewed by the community in a positive light for being out of sight and out of mind. This method is consistently put forward as a preferred alternative to elevated rail but significant missed opportunities are inherent to such an approach. While there is typically uplift around station precincts, the rail line between these stations remains as an impermeable barrier, occupying significant tracts of precious land in already constrained neighbourhoods and physically separating communities. Crossings for cyclists and pedestrians are generally only provided at major roads, often tied in with major signalised intersections, thereby missing the significant opportunities to improve connectivity across the entirety of the corridor. While there is some spatial efficiency in being able to site station facilities above tracks, car parking is generally pushed to the periphery of the station or road edges, often landlocking the station within an expansive car park when what is really needed is a direct dialogue between the station and surrounding activity. Within the five station precincts, the spatial efficiency of locating station buildings and car parking under the viaduct further opened up the space around each of the stations within the heart of each activity centre to enable the development of a series forecourts, village squares and multi-use activation nodes. Providing a direct connection between the stations and surrounding activity, these community spaces punctuate the journey along the Djerring Trail with intergenerational activity and provide significant, locally responsive uplift to the station villages and surrounding businesses. Grade separating the entire rail corridor gave supreme flexibility to designers to cross the corridor at not only major roads but to provide additional connections in between, vastly improving connectivity between previously divided communities. 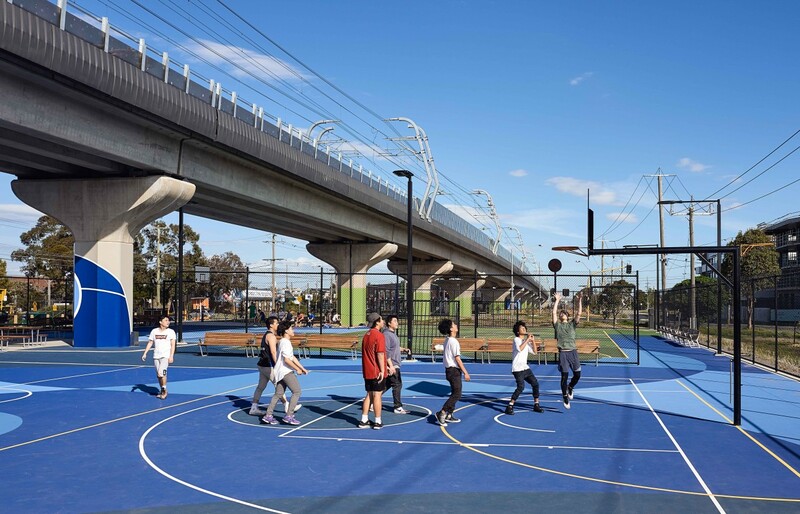 The intersection of these crossing points with the main Djerring Trail became logical focal points for the development of further local activity nodes, providing rest points, fitness equipment, bike servicing stations and informal play areas. Encouraging use and occupation of the space has the added benefit of bringing many sets of eyes to the corridor, elevating feelings of safety, discouraging anti-social activity and, in turn, encouraging further use. While less tangible, the flow-on effects that increased physical activity and social interaction have upon the physical and mental health of the community are well documented, and it is here that the project may well leave its greatest legacy. Whether it be walking or cycling along a green and leafy corridor, cycling to the station before catching the train to work, playing sport, or simply having a chance encounter with friends, elevating the tracks enabled the project to establish the social and physical infrastructure that will improve the holistic health of public transport users and the community. What Is Needed To Make These Projects Successful? A new approach brings with it new challenges including dealing with the impacts of shade, visual intrusion, overlooking, water management, and the complexity of delivering a cohesive response that spans multiple local government areas and oversight authorities. The project demanded a re-imagining of what rail infrastructure looks like and how it functions. It meant departing from the old standards and approaches and developing new, more sympathetic solutions. This was not the place for cookie cutter responses. Extensive research, optioneering and advocacy were needed to find solutions to these challenges and obtain buy-in from stakeholders. The rail line and new stations form significant new landmarks within each neighbourhood. Quality design was paramount, from the big moves of how the stations interact with the existing neighbourhoods, to finer details such as the form, materiality and function of each project element. 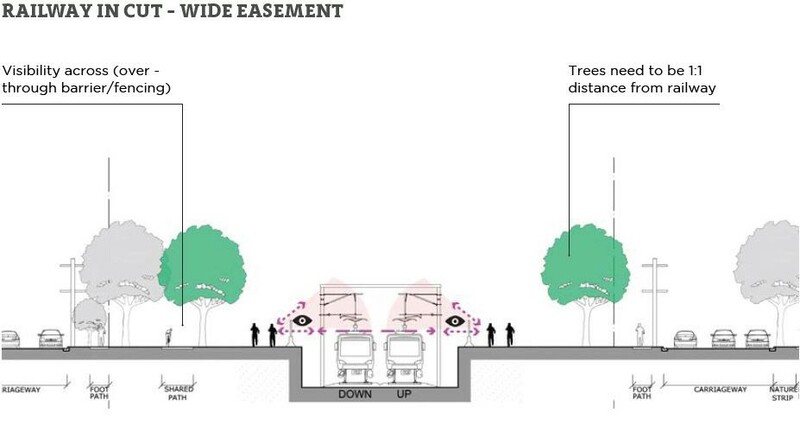 There is no denying that some level of visual impact is unavoidable, particularly upon properties that immediately abut the rail corridor, however the approach to rethinking design went a long way towards mitigating such impacts. The significant community mobilisation in voicing concerns about the project should be seen in a positive light: it brought issues and genuine concerns to the fore of decision makers’ minds and, perhaps most importantly, ensured that the State Government listened and provided a project budget that allowed the project to reach its full potential. A participatory design process was an important vehicle in ensuring that these community concerns moved from the realm of social media and over-the-fence conversations into real, constructive inputs that genuinely shaped the project outcome. The Community Open Space Expert Panel convened for the project brought together a range of key stakeholders and members of the local community and ensured that the outcome is reflective of their aspirations. The reality is that there is no single solution which will work across all projects. Every site is unique, with the best outcome needing a balanced assessment of the unique opportunities that each project brings, coupled with due consideration of the potential impacts upon individuals and the community at large. Both approaches to grade separation can be executed very well – and conversely both can be delivered poorly. Regardless of approach, the delivery of significant, truly transformational infrastructure projects requires a high degree of alignment and trust across the delivery team and key stakeholders. The entire team, from management to construction, must value the worth of each individual piece in creating the whole, and be tenacious in holding true to an initial vision across a long design and construction process. While it is not without its challenges, elevated rail is something that should be embraced rather than feared. 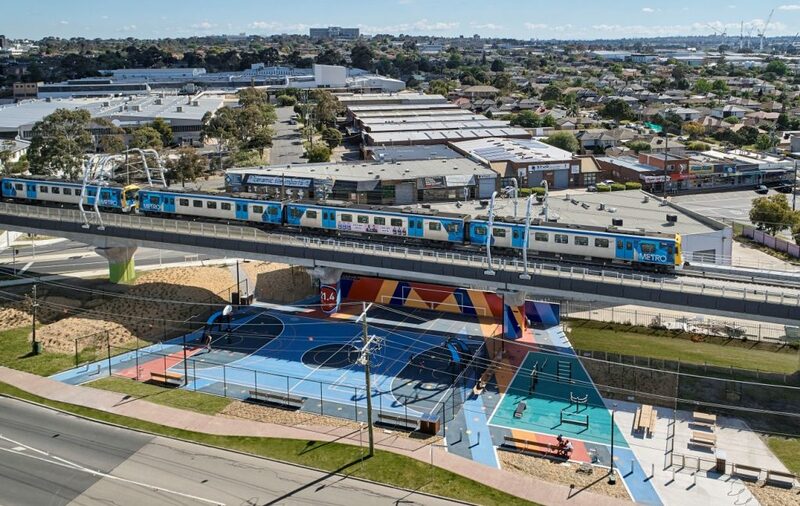 Provided it can be suitably integrated into its urban context, the opportunities it affords beyond just improving conditions for cars and public transport make it, in many respects, the superior alternative to approaching grade separations in Melbourne. When delivered by an enlightened, driven and unified team that engages with the community and stakeholders, the elevated approach to rail has much to offer in unlocking rail corridors to be more than mere conduits for trains. 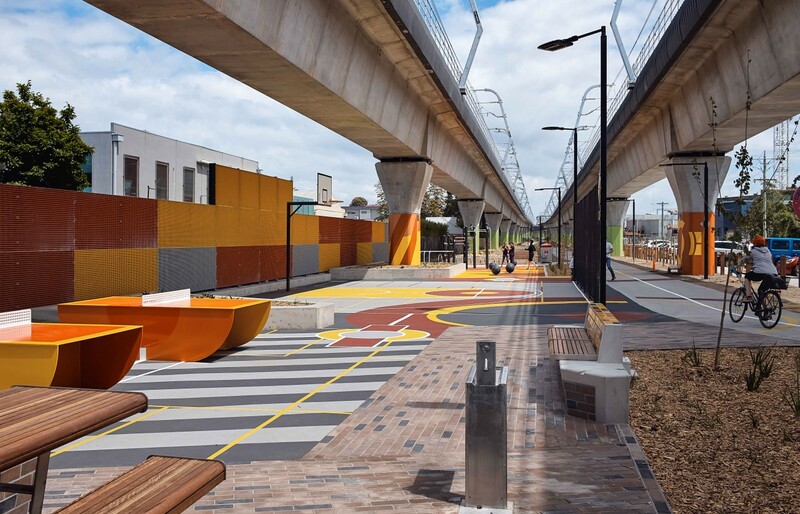 The completed Caulfield to Dandenong Level Crossing Removal has recently been reviewed by Foreground: 'After the ribbon cutting: lessons learnt from Melbourne’s sky rail'.